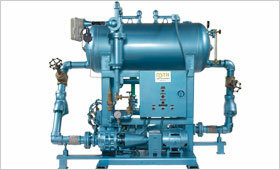 Roth Pump standard steam condensate pump stations are the most popular and meet most water applications. These units will deliver hot water at temperatures up to 200˚F (93˚C) and will not vapor bind at 210˚F (98˚C). Receiver capacities from 8 (30 liters) to 50 gallons (189 liters) can be supplied on these standard condensate pump units. Steel, cast iron, or stainless steel receivers can be supplied. 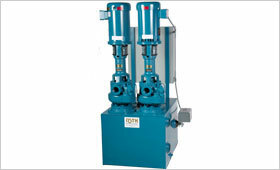 All pumps are constructed of 416 stainless steel shafts with solid bronze impellers. A mechanical float switch automatically turns the pump on and off for demand. Internal float and float rod are made of stainless steel. Pumps are top mounted on tank to keep all mechanical seals above the water line eliminating the risk of seal failure. Motor speeds operate at 1750 rpm. All Roth Pump impellers are engineered to resist cavitation, insuring extended pump life and stable operation. Collect and return hot steam condensate to the boiler or boiler feed unit in low-pressure steam heating systems. Engineered to resist cavitation, insuring extended pump life and stable operation. Pumps are top mounted on tank to keep all mechanical seals above the water line. A float switch turns pumps on and off automatically. Tanks are cast iron and have a 2" NPT female intake connection and 1" NPT female discharge connection. They also have a 1/2" NPT female drain connection. All have an open drip proof (ODP), continuous duty, single-phase motor, and are wired for 120 VAC. They have a junction box with screw terminals. Temperature range is 160° to 200° F. Made in the U.S.A. Single pump units (6F & 27F) - measure 26" Ht. × 17" Wd. × 17" Dp. Dual pump units (27FD) - To handle high condensate volume, the workload is distributed between two pumps for a longer service life than standard pumps. The second pump also provides redundancy so one pump can operate while you work on the other. This model measures 26" Ht. × 22.5" Wd. × 22.5" Dp. * Free shipping valid for online orders only. *Accessorial shipping service costs such as liftgate, inside delivery. etc. to be paid by buyer. Online orderING available for the continental United States Please call 1-888-444-ROTH to order outside this area. * Indicates option for receiver material type F= Cast Iron, S= Steel, SS= Stainless Steel.